Puppies tyrannizing Amundsen | Shackleton. 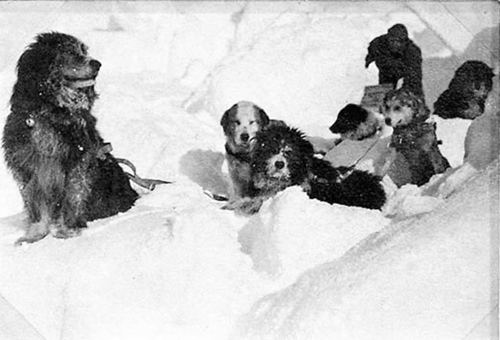 “Crean had started to take the pups out for runs, and it was very amusing to see them in their rolling canter just managing to keep abreast by the sledge and occasionally cocking an eye with an appealing look in the hope of being taken aboard for a ride. As an addition to the foster father, Crean, the pups had adopted Amundsen. They tyrannized over him most unmercifully. It was a common sight to see him, the biggest dog in the pack, siting out in the cold with an air of philosophic resignation while a corpulent pup occupied the entrance of his dogloo. The intruder was generally the pup Nelson, who just showed his forepaws and face, and one was fairly sure to find Nelly, Roger, and Toby coiled up comfortably behind him. Polar Explorer. Leader of the Imperial Trans-Antarctic Expedition, 1914-1917. This entry was posted in Other Voices, Shackleton. Bookmark the permalink. Shackleton is a Twitter novel by artist Peggy Nelson— follow along at @EShackleton. This blog is the media companion to the novel.